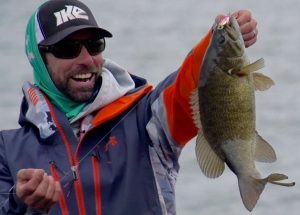 When anglers think about fishing a tube they usually think about dragging one along the bottom while looking for smallies or, in some situations, flipping and pitching them into heavy cover for largemouth holding tight. But when I think about fishing a tube — at least some of the time — I think about snapping it. It’s a super efficient technique when you want to target deep bass that have seen every crankbait and every jig that’s ever been made. Snapping isn’t a hard thing to do. Just cast it out with a fairly long cast, let it fall to the bottom, drag it a short ways and then snap it up as high as you can. As it falls back down, bow into it and watch your line carefully. Most of your bites will come as it falls. If you see the slightest twitch or if it doesn’t fall down far enough, set the hook. I always snap with a Berkley PowerBait Power Tube. They come in sizes that range from 2-1/2 inches to 4-1/2 inches and in at least 16 colors. Matching the hatch is no problem. The neatest thing about them, though, is that they have really thin walls. Driving the hook home is no problem. It slips right through the plastic. My heads are VMC Tube Heads. Depending upon the depth of the water I’m fishing and how fast I want my tube to fall I go with something anywhere between 3/8 and 3/4 of an ounce. I like these heads because they make rigging easy, the line tie has exactly the right angle and with a minor adjustment you can make your jig spiral the way you want. I wet mine before I insert it. It goes in easy that way without a struggle and without damaging the tube. If you want a wide, lazy spiral, leave about a 1/4-inch of the head out of the tube. If you want a tight spiral, put it all the way in so that the plastic closes around it. There’s no set rule about when they want it one way over the other. It’s trial and error all the way. Even though they’re a little bit heavy I snap my tubes on spinning tackle. My rod choices is a 7 foot, 2 inch Abu Garcia “Ike” Finesse Spinning Rod, medium action. 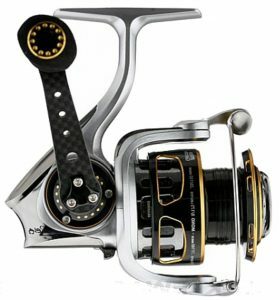 I mount a 30 size Abu Garcia Premier Spinning Reel to it. 100% Fluorocarbon, 8-pound-test. If I’m deeper than that I use Berkley Trilene Professional Grade Braid with a fluorocarbon leader — same brand, same test weight. I don’t want even the smallest amount of stretch at those depths and I don’t get any with braid. A huge percentage of the bass have moved out deep by now. Take advantage of that by snapping a jig. I guarantee you’ll catch ‘em. Do you know about Ike’s Celebrity Pro-Am Tournament, July 8 on the Delaware River, off of the Camden Harbor? Sign-up with one or two buddies and you’ll receive a free invitation to attend the Benefit Dinner with all the Professional Anglers the night before. Meet Ike, Pete Gluszek, Joe Sancho, Chris Zaldain , Trait Zaldain, Charley Hartley, Cliff Crochet, Stephen Kennedy, Terry Baksay and many others. Want to learn more about tube fishing and fishing for small mouth bass? The Bass University offers three instructional seminars on the topic at BassU.tv.